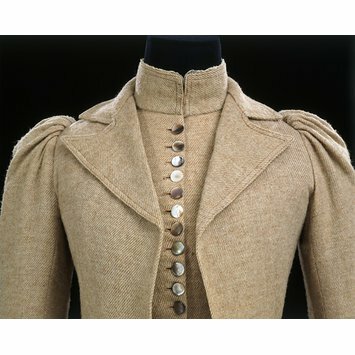 As women engaged in a wider range of activities in the nineteenth century, more practical clothing styles were adopted. Tailor-made outfits such as this one helped meet the needs of a diverse lifestyle. Plain woollen costumes were considered ideal for a variety of leisure pursuits and could be adapted for sports such as shooting and golf. They may not have been more comfortable than other styles but the hard-wearing fabric and relative lack of trimmings made them easier to care for and very versatile. Style was not necessarily sacrificed for function as elegant, close-fitting designs graced the pages of tailoring journals. Some featured jackets and skirts in contrasting checks, stripes and diagonals, others, like this one, were made of the same material throughout. Vests based on the man’s waistcoat were another popular feature. Here the jacket is semi-fitted with no shaping in the front or fastenings so that it shows off the waistcoat underneath. The pearly tones of the buttons complement the soft colour of the cloth and the ruffled frill on the stand collar adds a delicate touch. 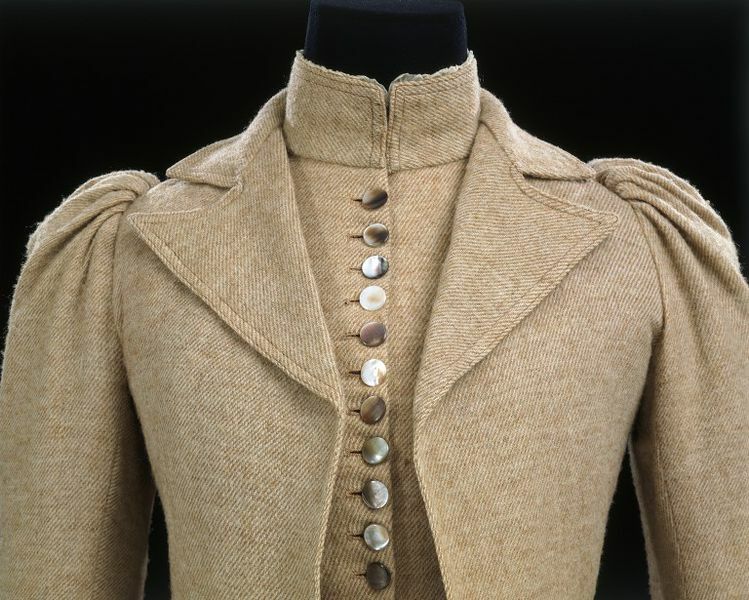 Women's tailored ensemble consisting of jacket, waistcoat and skirt of wool tweed.